Titan Poker offers all the known and famous poker games. Here you can play such famous poker games as Texas Hold'em, Omaha Hi-Lo, Omaha Hi, Seven Card Stud and Five Card Stud. Besides the poker games, you will find here many other card games, including the Roulette Pro, Jacks or Better, Blackjack, Wild Viking, Deuces Wild, Caribbean Stud Poker and more! The poker games have the standard Limit, Pot-Limit and No-Limit tables, so you can choose your preferred playing style. An additional nice feature is the Beginners Tables. These rooms are great for beginning players and the stakes in them range from $0.01/$0.02 to $0.50/$1.00. You can take your seat here and play with smaller blinds until you feel ready to move on to higher stakes and other tables. The high stakes at Titan Poker go up to $200/$400 for a table. There are various room capacities available, so you can decide against how many players you want to compete. There are tables for 6, 8, 10 players and the Heads-Up where you face one opponent. Players' difficulty range from beginning players to more aggressive and serious players, so you can find your spot here pretty quickly and fit in according to your poker style and level. The beginners are usually found in the low stake tables and the Beginners Tables, and as you move to higher stakes, the players get more aggressive and the competition gets a bit tougher and more challenging. Deposit Options: VISA, MasterCard, Neteller, Moneybookers, ClickandBuy, InstaDebit, Click2Pay, EcoCard, Paysafe card, ukash, Bank transfer, iDeal, Przlewy24, POLI, WebMoney, myCitadel, UseMyBank, EntroPay, Wire Transfer, bank draft, personal check. Withdrawal Options: VISA, MasterCard, Neteller, Moneybookers, ClickandBuy, InstaDebit, Click2Pay, EcoCard, Paysafe card, ukash, Bank transfer, iDeal, Przlewy24, POLI, WebMoney, myCitadel, UseMyBank, EntroPay, Wire Transfer, bank draft, personal check. Support is available via e-mail and a 24 hours, 7 days a week telephone support with several local numbers as well. Questions are answered and problems are solved quickly and professionally. As a solid proof for the wonderful support you receive here, just know that Titan Poker received the "Gold Gambling Online Magazine Award" for best customer service. Titan Poker offers you over $16 Million in monthly guaranteed tournaments! Titan Poker holds Freeroll Tournaments, Points Tournaments, VIP Tournaments, Guaranteed Prize Tournaments and Daily Tournaments, so there is plenty to choose from. The Freeroll Tournaments offer beginners to join a tournament for free and win real money. The prize pool is $50 and that's always a good amount to start with and enrich your bankroll. Points Tournaments are the ones you enter using the points you've earned while playing the money tables. The more you play, the more points you earn. That gives you the opportunity to enter tournaments with prize pool of $50, $300 and even $500 without having to pay for them. Again, a great way to earn more money for free. The Guaranteed Prize Tournaments are a bit heavier and it costs a bit higher to enter them, but the prizes you can win range from $50,000 up to $250,000! If you think you have what it takes and you're good enough to compete there, go for it. VIP Tournaments are tournaments you can enter according to your VIP level. The higher the level, the bigger the tournaments you can enter. There's a weekly $1,000 VIP Freeroll for levels 2-6, a monthly VIP $2,500 for levels 3-6, and another monthly VIP $5,000 for levels 4-6. The more you play, the faster you progress in the VIP levels and the more bonuses you get (monthly cash bonus for up to $100, faster point accumulation, special reload bonus and more). 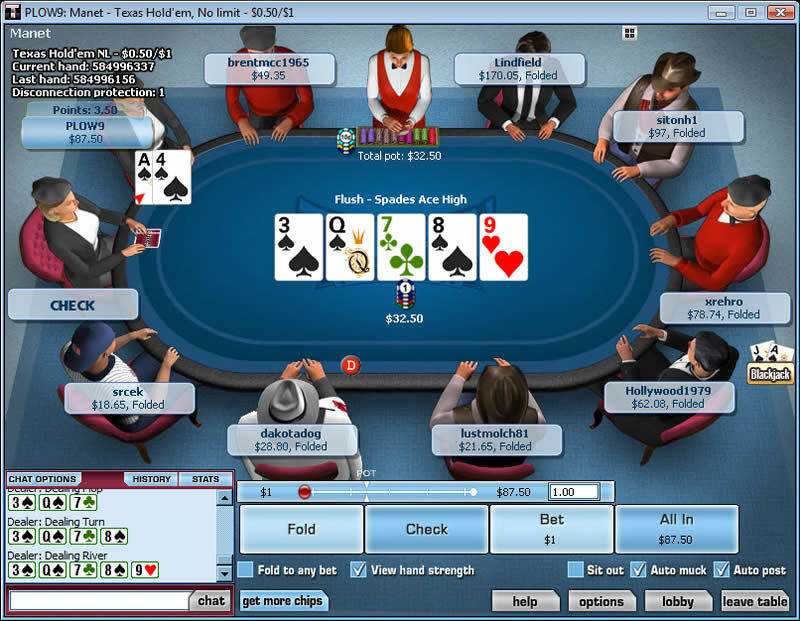 Titan Poker also runs Daily Tournaments with buy-ins that range from $1.10 up to $320! There are also tournaments where the buy-in can be bought by the points you've earned. You will also find here various Satellite tournaments that provide you with the opportunity to enter huge prize pool tournaments like the Irish Open, the ECPoker Tour, the Grosvenor UK Poker Tour and more! As for the Sit-N-Go, there are many tables to play, with number of players and buy-ins changing from room to room. You can find SNGs with 3, 5, 6 players, as well as SNGs with 10, 12, 18 players and up to Sit-N-Go's with 50 players. As for the buy-ins, they range here from $0.12 and up to $5,200! Of course the higher the buy-in, the higher the prize pool for that room is. Titan Poker grants you a 50% bonus on your first deposit up to $200. You receive this Titan Poker bonus in several parts as you play the tables, until your entire bonus amount is cleared. So, the more you play, the more you earn and the faster you get your bonus. Titan Poker also has a special VIP program, so the higher your level is, the more bonuses you receive. The bonuses include Loyalty Cash Bonuses for up to $100 a month just for being a high VIP level and playing at Titan Poker, an entry to exclusive tournaments, faster point accumulation and even special reload bonus. - Titan Poker has a special VIP system which gives you great bonuses (monthly cash bonus for up to $100, faster point accumulation, special reload bonus and more). Therefore, the more you play the more money and points you earn and the higher you VIP status is, which means more money and more bonuses for you each on a monthly basis. - Another feature Titan Poker offers is the points you earn while playing the tables. With these points you can enter various tournaments or use them in the Titan Poker store to purchase various cool merchandise. - There's a special feature for first depositors as well, as they will be awarded five free entries the New Depositor Freeroll Satellite and from there, 50 places will be awarded a seat to the $20,000 New Depositors Freeroll Tournament with a guaranteed prize pool of $20,000. 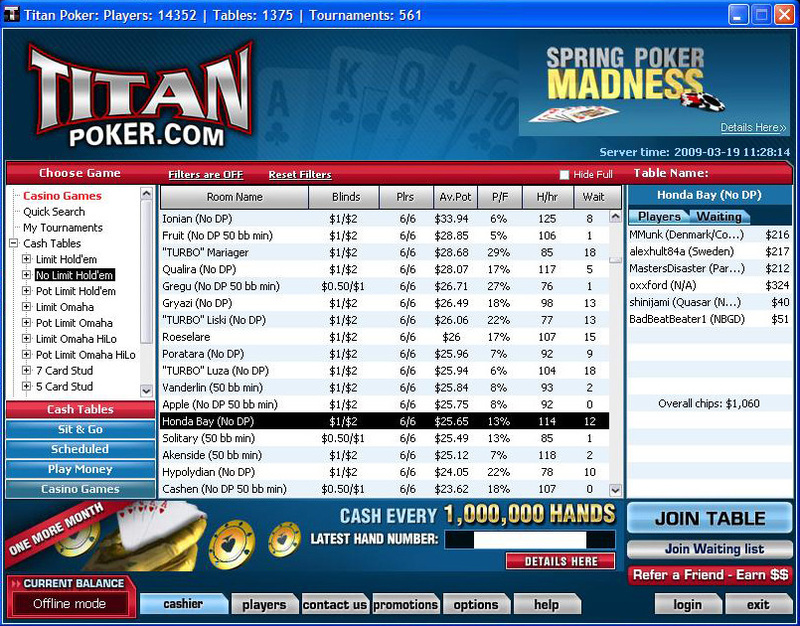 - Another great feature you don't want to miss is the Titan Poker Speedy Alert. With this new and free feature, you will never miss another tournament, as the software will alert you of upcoming tournaments and even poker bonus offers, so you can always be updated and won't miss a thing! - Titan Poker also holds the Fort Knox $50,000 Progressive Jackpot SNG, so you have the chance to grab it all by yourself. Winner of six consecutive 6-player Fort Knox Jackpot SNG wins the big prize. But the best part is that the prize pool grows by $10,000 each week if there is no winner! See if you're up to the challenge. There are also the $25,000 Rio Progressive Jackpot and the $15,000 Maui Progressive Jackpot. There is also a Top Hand of the Day Bonus and Bad Beat Bonus, which means that whether you win or lose with the monster hand you've been dealt - you might get paid in either case.